I Love You More Than Carrots: Hispter Woodland Nursery and First Birthday Inspiration. Hispter Woodland Nursery and First Birthday Inspiration. It's time. It's time to start planning our last first birthday party. I'm obviously a mix of emotions. These last nine months have been the fastest nine months of all time and yes, I'm aware that all moms say these sorts of things, but of all the boys' first years, this one has flown by the fastest. Undoubtedly I can think of three reasons why and they rhyme with Shmarter, Shmaclane and Shmollins. It was my husband's idea to go big or go home this time around and if you know my husband, when he says something of this magnitude, you run with it. You don't waste a minute planning and you certainly, above all things, do not ask any questions. That being said, I've begun drawing inspiration from Collins' half-finished nursery to celebrate his first year. On top of everything else, my goal is to have his nursery 100% completed by his birthday. Along with losing twelve pounds, refurbishing our master bathroom and potty training my almost-three-year old. Because why not? The inspiration for his party began with the vision board I created for his nursery. 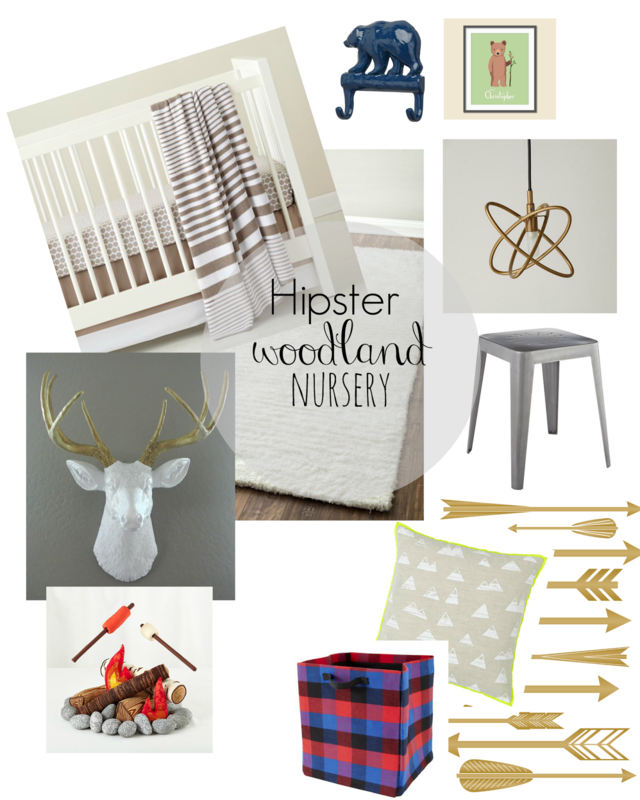 The theme of his nursery is "Hipster Woodsy" which basically allowed me to hang a white ceramic deer head in there with gold-dipped antlers. It's quite a change from Carter's preppy nursery, Maclane's vibrant nursery and the big brother's shared nautical space. Since a large part of the décor came from Land of Nod over the years, I returned there to finish the space as well as draw inspiration for his birthday. The theme of his party will be along the same lines. A little more woodsy, a little more camp themed. bedding, bear hook, pendant light, nightstand, accent pillow, basket and campfire c/o Land of Nod. Thankfully, all that's left to do in the space is apply the arrow decals to the wall behind the changing table, spray paint the bear hooks white, change out the curtains to a pair of hand-painted drop cloth curtains and find a similar nightstand at a lower price point. Oh and refill the beans in the sad excuse for a cable knit pouf that's in there. Then and only then can I safely say that I've decorated my final nursery. Totally manageable, no? Oh, did I mention that we'll be throwing a joint first birthday party with my niece? She's the closest my boys will ever get to having a sister and since the baby bond between Collins and Talia is already quite strong, we figured what better way than to celebrate them..together? So picture that vision board above with some special girly touches thrown in. I love me a good party, despite hemming and hawing over the stress of planning it and the burnt fingertips from DIY projects gone awry. 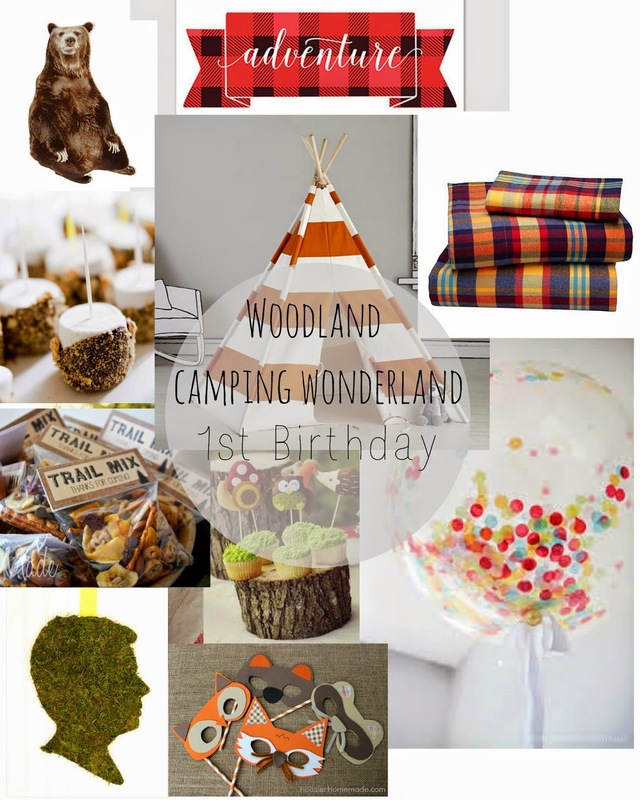 We've done a Carnival-themed first birthday, a Where The Wild Things Are party and soon enough, a Woodsy Camping Bash. Tell me, what was a favorite theme of a first birthday (or any birthday party, really) that you threw? I love the woodsy theme and how it matches the nursery. The trail mix favors and s'mores treat are great! Totally cliche, but my daughter's birthday is January 2, so her first birthday was 'Winter ONE-derland'. It was pink and silver and snowkflakes and sparkles. I made and decorated her cake and it was covered in pink roses, and it is still my favorite cake I've ever made.